I’m kind of blown away by how much the Peach Amiibo breaks Super Mario Odyssey. 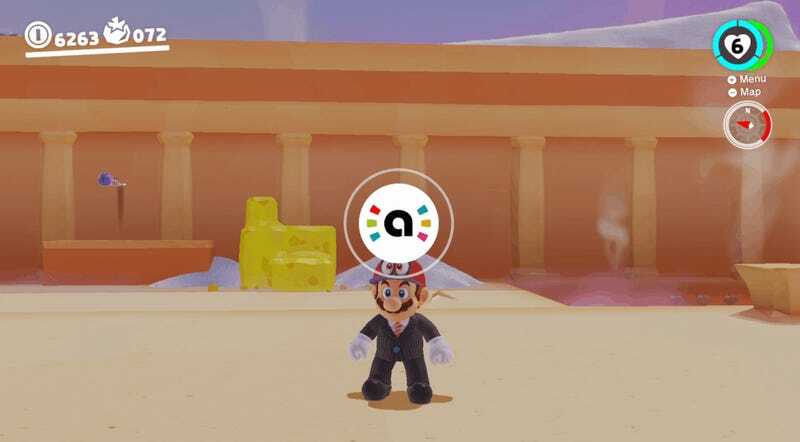 Like most of Nintendo’s Switch games, Super Mario Odyssey lets you use your stash of Amiibo™ brand interactive gaming figurines in a variety of ways. A souped-up Roomba named Uncle Amiibo will let you tap figures to find hidden Moons, and you can also tap any figure at any time for a little boost of a few coins or a heart. Of course, it’s the Mario, Peach, and Bowser Amiibos that have special uses. If you buy the new editions of these figures in their wedding outfits, they’ll unlock those outfits as costumes and yes, that does mean you can dress Mario in a beautiful wedding gown. But any version of the Amiibo for these three characters will also have special functionality in the game. Using a Mario figure will grant 30-second invincibility, using a Bowser one will reveal the locations of whatever purple coins you’re missing, and using a Peach Amiibo will give Mario a Life-Up Heart. There was some kind of limit to how often this could be used (once a day, once per level, once per life, something). As it turned out once I tried it, my beliefs were extremely not accurate. The item that Peach grants you is one of the big ol’ hearts topped with a crown that boosts your max life points from three up to six. These are rare to find in the game, although you can buy them for 50 coins each from any shop. Using a Peach Amiibo, you can get one of these whenever you want, as often as you want. It is an all-you-can-eat Pasta Pass of hearts. It takes a few seconds to scan the figure in, so it would not be a great idea to scan it when you’re jumping over a pit, but I was able to do it in the middle of boss fights. Many of Mario Odyssey’s toughest challenges aren’t really helped by having more energy, since they’re often focused on jumping or maneuvering over bottomless pits, which don’t care how much health you have. But if you’re running out of life? Peach is there whenever you need her.